When cornered by people and asked what kind of painter I am, I usually prevaricate but end up saying I am a painter of landscapes. It seems a banal way to describe what I think I do, but it usually elicits a knowing look in my interlocutor and the conversation ends with a whimper. Landscape painting as a genre is not very groovy right now. It is deemed romantic (bad, bad, bad) and decadent (bad, bad, bad) and decorative (really bad, bad, bad). But despite my own allegiances, I have to confess that I was loathe to go off and see Renoir’s landscapes at the National Gallery. Frankly, I was dreading it. Wearing my art historian’s magic cloak I have written about the Impressionist experiment in some detail. It is a compelling experiment that has yet to be fully understood. 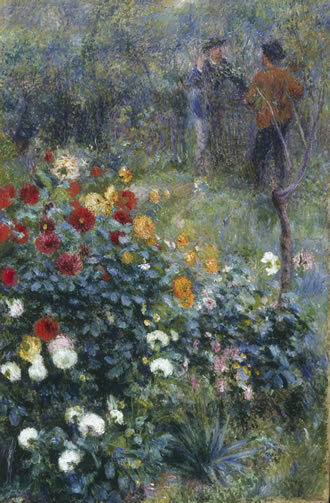 But, with some notable exceptions (for example Renoir’s portrait of Monet’s wife Camille, son Jean sprawled on her lap) I have relegated Renoir to an inferior status – the runt of the Impressionist litter and a man of little psychological subtlety. The perpetrator of some of the most saccharine female nudes in the history of art, he has been guilty, in my book, of sentimentality and laziness, hardly there at all in the pushing out of the envelope stakes. In a 1966 interview Bob Dylan riffs in his Bob-ness about the “sound of pictures”. The sound of painting seems an excellent way to think about them and Renoir’s have always struck me as tinny, thin and monotonous. So I was quite surprised if not humbled, to find myself artistically and intellectually engaged by this show. It has been accused by others of being a crowd pleaser and no doubt it will be precisely that – and good luck to the National – but it is more than this. The hang is indeed somewhat idiosyncratic and not chronological, but each room (there are four which seems just about right) contains at least one riveting work. The benign influence of “Papa” Corot is manifest early in the show. On a gloomy London winter morning the early, small, Corot-like pochade or sketch, Country Road near Marlotte of 1865, has a vibrant, luminous immediacy that excites the eye with its fizzing brushwork in the painting of the trees. 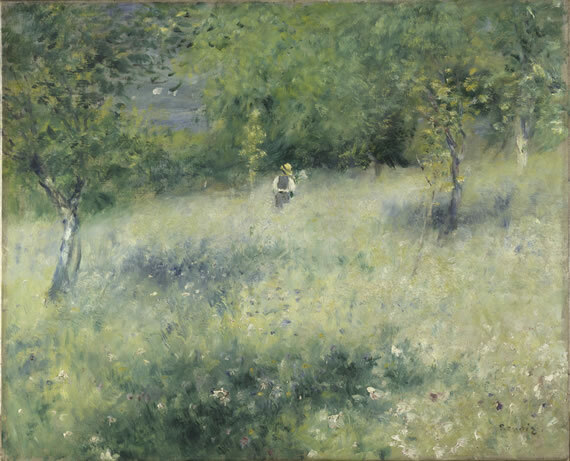 It moves in and out of focus with the movement of leaves, and the wedge of bright, light saturated foreground finds its counterpoint (music again) in the loosely painted wedge of blue sky. 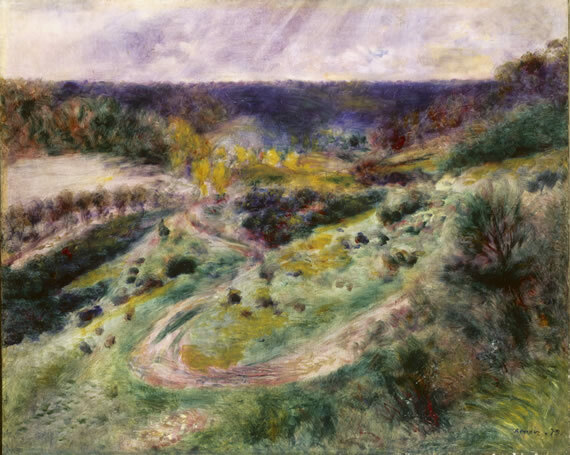 The stately, elegant, restrained A Clearing in the Woods of the same year is in the same room and we see an objective scrutiny of nature that is sometimes all too absent in much of Renoir’s oeuvre. Then we have Spring in Chatou of ten years later, a fully “Impressionist” work in which any given inch might be authored by a fellow member of the Impressionist cohort. And there is a viscous, watery tonality, with a rejection of narrative, that points towards his friend Monet’s Waterlilies of the 1890’s. Allée in the Woods (1879) and Landscape at Wargemont in room three are, for me, the nodal points in this show. In one painting, we have an investigation of sous-bois light of a forest floor that manifests what Delacroix called “the thinking touch” and seems to evoke the undergrowth of thought itself. In the other – the masterpiece of the show – there is everything that I, as a painter, want from the form. 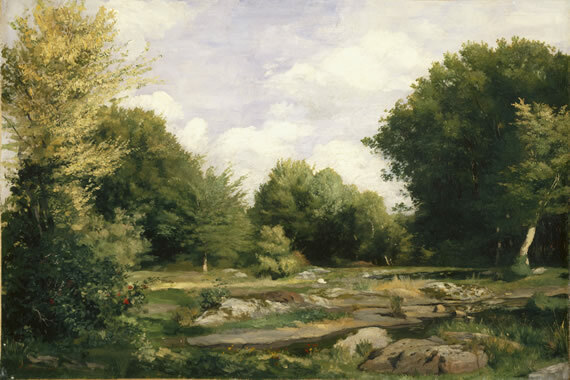 The landscape is more a depiction of an internal vision prompted by looking at the “real”. Painted thinly over an opaque white ground, the purple sky drips into the cobalt sea which winds itself around the silky pink loops of a country path. The sound of the painting is soft and cool. In contrast, the magnificent Waves of 1882 in the final space is heavy, opaque and dense, constructed in thickly painted impasto. I left this show chastened by my own prejudices and – rarest of all experiences – surprised.